And all orders can be easily monitored in the subscriber's eLaw account. No more slips or phone calls! With eCopy, customers can receive a full range of documents throughout the lifecycle of the case - not just after the request for judicial intervention (RJI.) 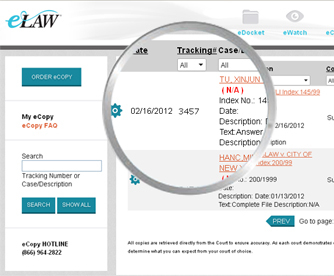 If a document is filed, eLaw can get it.